While the last two day the trade winds picked up. Yesterday I went on my Slalom gear to train in 35 knots of wind. It was fun and I really felt good doing jibes. The training in lighter winds helped me to improve. All the topguys were on wavegear, also BjÃ¶rn. I would love to sail Slalom with some other guys, but this discipline is not very popular here. And I can understand whatÂ´s the reason. The waves are really consistent. In the late afternoon, the tide went down, super clean sets ran into the bay of Pozo. The kids ripped like hell and Jonas Ceballos and Dario Ojeda as well. By the way, Dario changed from Gaastra to Goya sails. Today the wind was up and all the Northsailriders were flying around in the air and ripping the massive swell at Mosca point. Nice to watch. 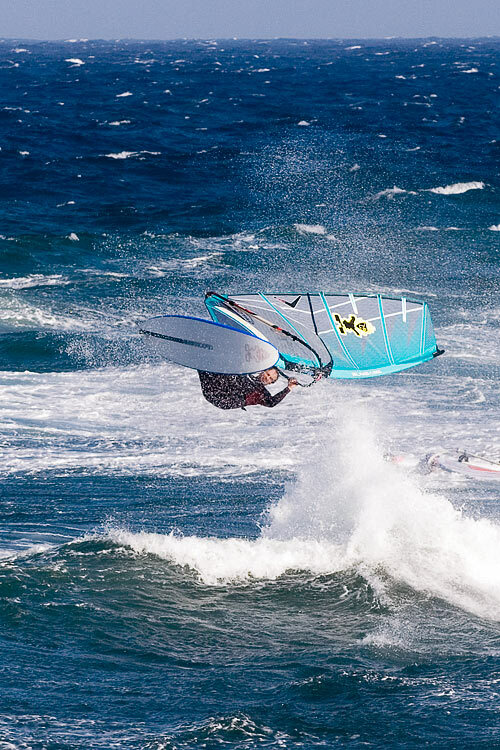 Vidar Jensen jumped so high, you canÂ´t believe it and Daida tweaked her pushloops super extreme. It was so impressive. After driving around and checking the other spots, Kerstin sailed in Aquila Playa, we came back to Pozo. Th ewind was super strong. 30 to 35 knots at the beach and some nice sets. I went out on my 4,2 Gator and the EVO 75. Since November last year I did not sail with such a small sailsize. The gear worked awesome, but I was scared to rotate into massive moves. But I felt some improvement in onshore waveriding and landed a super fast backy. Not high, but gets better and better day by day. The forecast for the next 4 days is very promising and Pozo or Vargas should work fine. We passed by some other spots today, which could work very well in strong wind periods.